Ruhr-University Bochum researchers have developed a new mechanism to protect enzymes from oxygen as biocatalysts in fuel cells. These enzymes, known as hydrogenases, are just as efficient as precious metal catalysts, but unstable when they come into contact with oxygen. They are therefore not yet suitable for technological applications. The new protective mechanism is based on oxygen-consuming enzymes that draw their energy from sugar. 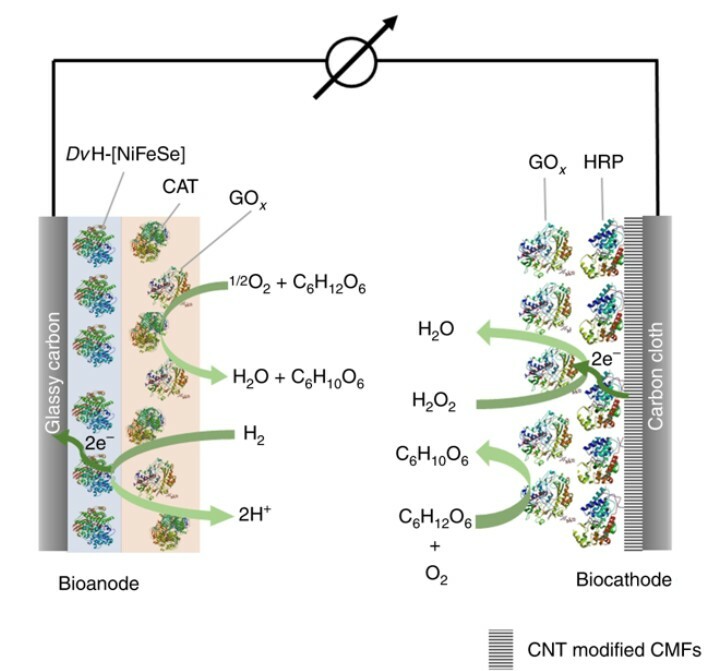 Schematic of the proposed hydrogenase/horseradish peroxidase biofuel cell. There is a full description at Figure 1 in the open access study paper link below, Image Credit: Ruhr-University Bochum. Click image for the largest view. The researchers have shown that they were able to use this protective mechanism to produce a functional biofuel cell that works with hydrogen and glucose as fuel. The team led by Dr. Adrian Ruff and Professor Wolfgang Schuhmann from the Center for Electrochemical Sciences at Ruhr-Universität Bochum together with colleagues from the Max Planck Institute for Chemical Energy Conversion in Mülheim an der Ruhr and the University of Lisbon describe the results in the paper published in the journal Nature Communications. The team from the Bochum Center for Electrochemical Sciences had already shown in earlier studies that hydrogenases can be protected from oxygen by embedding them in a polymer. “However, this mechanism consumed electrons, which reduced the performance of the fuel cell,” says Adrian Ruff. “In addition, part of the catalyst was used to protect the enzyme.” The scientists therefore looked for ways to decouple the catalytically active system from the protective mechanism. With the aid of two enzymes, they built an oxygen removal system around the current-producing electrode. First, the researchers coated the electrode with the hydrogenases, which were embedded in a polymer matrix to fix them in place. They then placed another polymer matrix on top of the hydrogenase, which completely enclosed the underlying catalyst layer. It contained two enzymes that use sugar to convert oxygen into water. Hydrogen is oxidized in the hydrogenase-containing layer at the bottom. The electrode absorbs the electrons released in the process. The top layer removes harmful oxygen. In further experiments, the group combined the bioanodes described above with biocathodes, which are also based on the conversion of glucose. In this way, the team produced a functional biofuel cell. “The cheap and abundant biomass glucose is not only the fuel for the protective system, but also drives the biocathode and thus generates a current flow in the cell,” summarized Wolfgang Schuhmann, head of the Center for Electrochemical Sciences and member of the cluster of excellence Ruhr Explores Solvation. The cell had an open-circuit voltage of 1.15 volts – the highest value ever achieved for a cell containing a polymer-based bioanode. This is great news. Yes there is a price is consumed sugar, but hydrogenase enzymes are just packed with possibility and not just for energy and fuel processes. Should this technology scale the chemical business could change for the better, bigger and lower cost into many more lower cost products. Congratulations. Indeed!